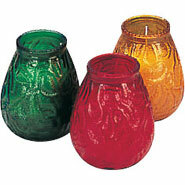 Glass Jar Candle boy traditional restaurant light for tables, excellent quality, 75 hour burn time, non scented. For colours see drop down box. Sold Singly., See more images for other colour samples, ideal for outdoor use.